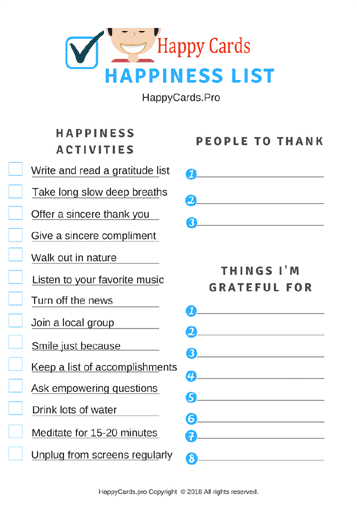 Free Happiness Checklist | Happy Cards - Happiness & Kindness Cards! Taking these steps every day will help lead you to experience less stress, less anxiety and more joy! Most of the items are self explanatory but many of them are covered by us in our course 50 Steps To Happiness. Gratitude is one of the keys to happiness and so writing things down every day that you’re grateful for and actually thanking people every day are powerful steps you can take to train your brain to be happier. The world needs a happy you to spread kindness around. Make sure you get in on the exciting new launch of our Happy Cards box program and get some happy going every month! CLICK OR TAP THIS IMAGE TO DOWNLOAD THE FREE CHECK LIST AND PRINT IT OUT RIGHT AWAY! USE GOOD PAPER. PRINT IT OUT AT HIGH QUALITY ON YOUR PRINTER. AND CHECK ONE ITEM OFF EACH DAY!